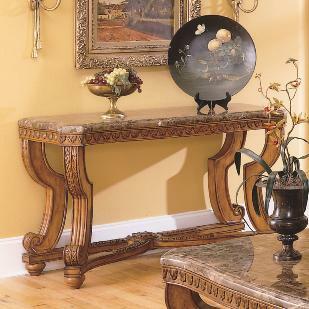 Display artwork and room decor on this beautiful sofa table. The thick shapely legs and base feature beautiful details and decorative trim in a burnished brown cherry finish. 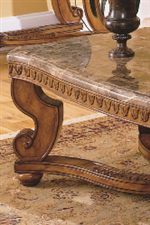 Topped with a thick beveled marble top to complete the traditional design. Pair with the matching end table and cocktail table for the complete set. The Tarantula Traditional Burnished Brown Cherry & Marble Sofa Table by Homelegance at Michael's Furniture Warehouse in the San Fernando & Los Angeles area. Product availability may vary. Contact us for the most current availability on this product. These old world Mediterranean styled tables are rich in the heritage look. Featuring a burnished brown cherry finish and beveled marble table tops. Fill your traditional living room with the Tarantula occasional table collection. The Tarantula collection is a great option if you are looking for Traditional furniture in the San Fernando & Los Angeles area. Browse other items in the Tarantula collection from Michael's Furniture Warehouse in the San Fernando & Los Angeles area.